Tool includes plexiglass frame, blades and pusher. Makes a perfect bag each time, frees up both hands for ribbon tying. Great for candy and Jordan Almond favors, rice, and birdseed throws, as well as confetti, glitter, potpurri and other treats! Three blades to make layers, page the layers so you can create the perfect favor everytime! These sturdy plates are fastened to the base to quickly align and fan out the different layers of fabric in your design. 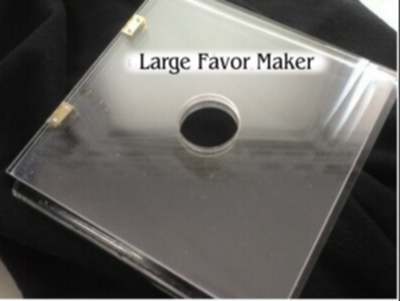 Center hole is approx 2.125", ideal for inserting larger items.